When I saw the recipe for lemon coolers on Pinterest, I took a stroll down memory lane! Lemon Coolers were my very favorite cookies when I was a teen in the 70’s, so I instantly knew I had to try the homemade version. That reminds me of a story! A few days ago I was talking to my next to the youngest grandson and telling him about something that happened when I was a little girl. His reply: “You were never a little girl, Nana!” I promise he didn’t mean it the way it sounds. Back to the coolers: The store bought kind was discontinued, but I recently heard through the grapevine that they were back. You can find them at Cracker Barrel. I try to stay far away from those little crisp, lemony bites of awesomeness. The homemade version of lemon coolers were so easy to make. The recipe does require cake flower, but the author of the recipe gives you instructions on how to make your own in case you don’t have any on hand. Cool! Also, I happened to be out of parchment paper, so I lightly greased the cookie sheets and mine turned out wonderful. Since this is a cookie from my past, I decided to pose them in a tiered tray that belonged to my mom when I was a little girl and now belongs to me. Are you old enough to remember these trays? And since I had tiny specks of powdered sugar everywhere, I went ahead and sprinkled some more. It was easier than swiping with a cloth. Max, the German Shepherd: OK, Max didn’t get one, but he was with me during the photo shoot and I had to keep nudging him back with my hip (that’s exercise, right?) because he wanted to gobble all of them! The two youngest grands: The grands were only allowed 2 cookies because their mom was here. Party pooper! But we did catch the next to the youngest trying to swipe another one and the youngest was caught trying to lick the powdered sugar from the tray. Son-In-Law #1 (the first son-in-law): These are the best cookies I’ve ever eaten! Me: They are delicious! Do they taste just like the ones I ate growing up? Not quite, but they are very, very good and more like a shortbread cookie. Here’s the recipe from Uncommon Designs. And I’m so thankful I found it! What was your favorite cookie growing up? I’ve never heard of lemon coolers! But these looks delicious!!! These are the best cookies I’ve ever ate. You’ve got to try them! Thanks! They are good! I’ll make some more when I get home from St. Lucia! These looks amazing! I love lemon flavored anything, so I will have to make these like…now!!! I was actually surprised at how well they turned out the first time I made them. I will be making them over and over! So easy! Daughter #1 (loves lemon anything) was delivered some by Daughter #3 at work and they are awesome! I told her to tell you I want some in my stocking! Sorry, I wrote the post before you received the lemon coolers. Remember, it was a couple of days later, but they were still so good packed in the air tight container. I will be happy to make you some to stuff in your stocking! I’m pinning, these sound too good! They are, Paris! And I’m sharing Loteda with my daughter! They look like a big hit to me! My favorite cookies growing up and now are sugar cookies. I can’t get enough of those! I like sugar cookies, too. I’ve always liked the Pepperidge Farm sugar cookies. Yum! These look and probably taste great. My all time favorite growing up and now was chocolate chip and m&m’s! Peanut M&M’s have always been a fave of mine, too. 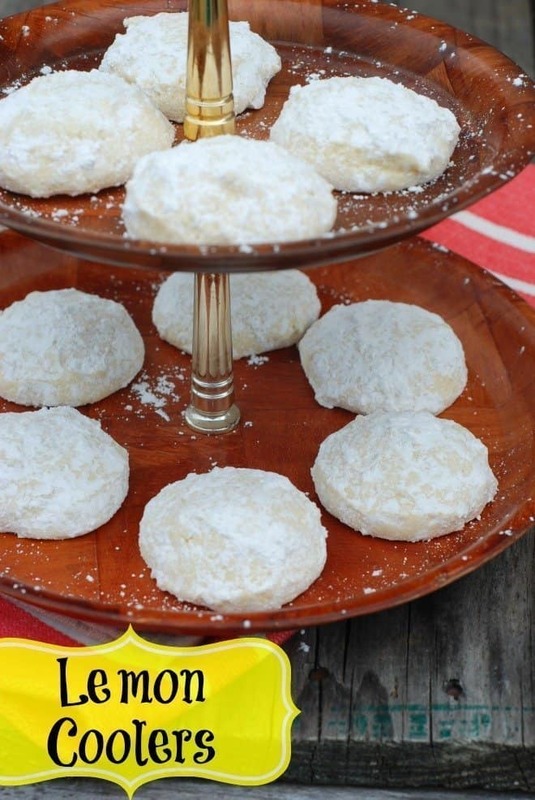 I most certainly do remember lemon cooler cookies! I was allergic to chocolate as a child, so except for the Oreos I snuck when no one was looking, all of my cookie favorites were the non-chocolate type. 🙂 Lemon coolers and Vienna Fingers (kind of like long vanilla Oreos) were my favorites! Your crew certainly gave this recipe a standing ovation! I can’t wait to give this “homerun” a try! Thanks for discovering and sharing! Pinned to use asap. I remember the Vienna Fingers! I wonder if they still make them. I used to LOVE these! I haven’t found a gluten-free recipe for them yet, though! 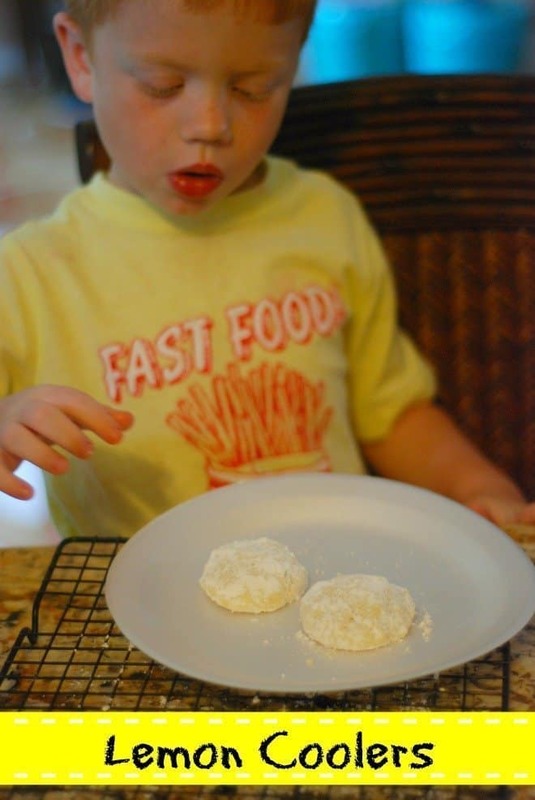 My favorite cookies growing up were always sugar cookies! After I had written the post, my daughter sent me a picture from Cracker Barrel featuring those lemon cooler cookies. They do look good. Love that tray too. I love the tray, too, Krystal, especially since mom gave it to me. They sure look scrumptious! These would be great for a summer treat! Those look really good! 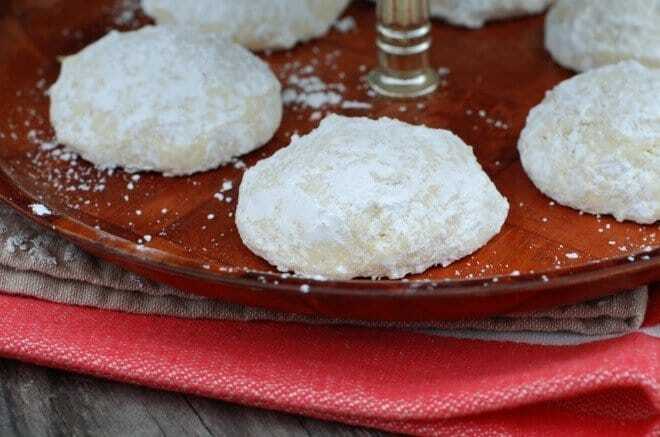 Pinned it to my Cookies board 🙂 They sort of remind me of Snoball Cookies with the powdered sugar. Grandchildren say the darndest things, don’t they! These are on of my most favorite cookies for the holiday! I love them with Tea.. thanks for sharing them at Fabulous Friday.